Explore fintech adoption in the U.S in this significant report that measures the adoption rates of financial technologies and services across generations. 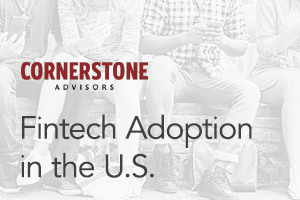 The Cornerstone Advisors report, commissioned by Q2, also introduces the Q2 Fintech Adoption Index. The index measures the acceptance of fintech startups as alternatives or adjuncts to traditional financial providers. Several emerging fintech services, including P2P payments, savings tools, neobanks, and investment tools, are discussed.